and it snows - and snows - and snows." Welcome to the last Meezer Musings of 2017! 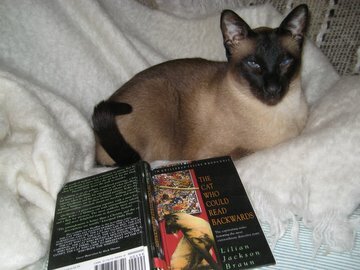 The quote above is the opening sentence of one of the Siamese 'Cat Who' novels by Lilian Jackson Braun - very relevant just now. 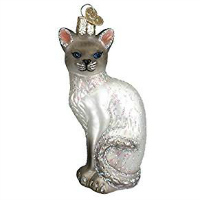 And, as it grows colder and darker for many of us, even if we're not as far north as "four hundred miles north of everywhere", we're bringing you a touch of Meezer-related fun, frivolity and sparkle to combat the winter chill as we head into the holiday season. Gifts, decorations, and a mix of the sad, the sensible and the silly all rolled into one! Along the way ... if you'd like something as bright and cosy as Christmas itself to read over the holidays we have a book recommendation for you; ask "when is a cushion not really a cushion?" and say a sad but fond farewell to a graceful princess. 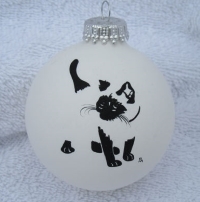 We also have ideas for gifts and tree decorations, and topical tips for keeping your cats safe and well throughout the holidays. 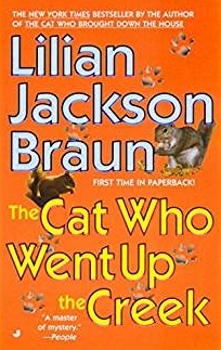 I always enjoy browsing through second-hand bookstalls to see what treasures they might hold, so you can probably imagine my delight this month to come across two of Lilian Jackson Braun's 'The Cat Who' mystery stories, particularly as they were ones I hadn't already read. It was in one of them that I found this month's opening quote. 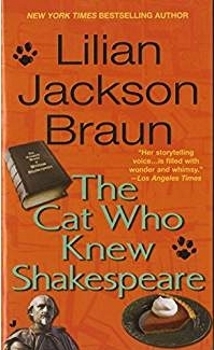 It's been a while since I read any of the books in the series (there are 29 in total) and I enjoyed re-acquainting myself with Siamese cats Koko and Yum Yum, their owner Jim Qwilleran, and the assorted cast of weird and wonderful characters that appear in the novels. Along the way Jim adopts first Koko (full name - Kao K'o-Kung) and then Yum Yum, and it is of course the cats - generally Koko - who solve the crimes! Sad news this month as we say goodbye to John and Erin Broemelkamp's Princess Leia (above right) who graced our Facebook page many times and who crossed the Rainbow Bridge on November 12th, from congestive heart failure. 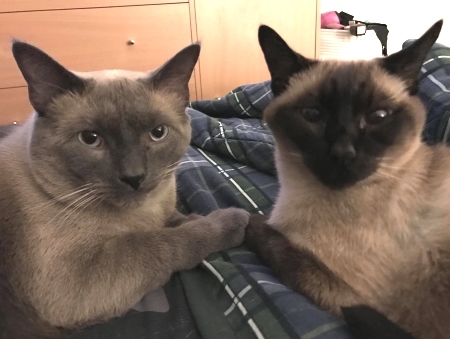 Princess Leia and her companion Han Solo were our Meezers of the Month in September; at that time Leia had just undergone surgery for a suspected hernia but had been recovering well, so her death was a shock. Our hearts go out to John, Erin and their family as well as their other kitties, especially Han, who will doubtless miss her terribly. It's hard to lose a much-loved feline family member at any time but especially so around the holiday season, so to all of you who've lost your kitties recently, we send condolences and our thoughts are with you. Christmas and other seasonal holidays tend to be times when there are lots of unusual foods, plants and other 'nibble temptations' around the house - and they're not always safe for cats, so here are some reminders to keep your cats protected and happy during all the festivities. Christmas trees. 1. Make sure your tree is securely fastened! I've even seen photos from folks who hang their trees upside down from the ceiling. While this may be going a little far, securing your tree by attaching it the wall if necessary, so that it can't topple over, makes good sense. 2. Vacuum up dropped needles frequently to prevent them from being nibbled or causing any other harm. Plants and flowers. Lilies (often present in flower bouquets) are lethal to cats and should be banned from the house. Poinsettia plants, more often around at Christmas, can also be toxic so are best avoided or kept out of reach. Christmas gifts. 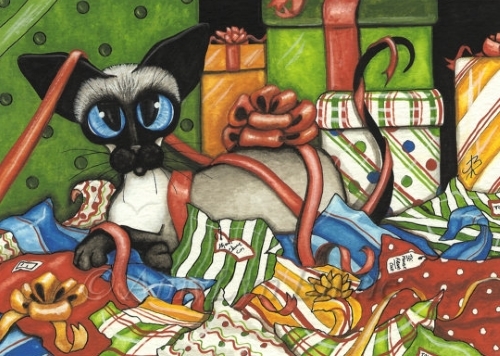 Siamese cats love to 'help' you wrap Christmas gifts, but make sure they don't accidentally swallow tape, string, paper or any other wrappings, and tidy up after yourself. Once wrapped, don't leave packages containing foods or treats under the tree - they're sure to be discovered, dismantled, and devoured! 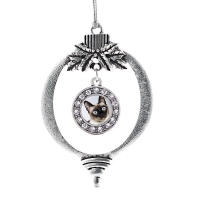 At this time of year I love browsing for Christmas tree decorations and I especially love finding Siamese cat-related ones. Here's a little selection of some I've found recently; they make perfect stocking fillers or little gifts for yourself or others. They're all available either from Amazon or craftmakers' platform Etsy - but hurry - at this time of year they do sell out very quickly! 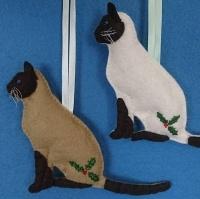 Looking for something really different for a Siamese cat lover? How about this clothes hanger? This has to be one of the most unusual (and funniest) items I've found in my search for Christmas gifts, but it's also surprisingly lovely and I have to say that now that I've seen it, I want it! Imagine a whole wardrobe full of them! It turns out there's a whole menagerie of other cats, dogs, mice and bears to be had as well. 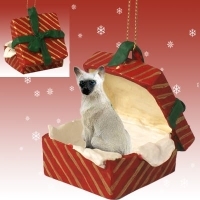 You can find the whole range on Amazon, but for the Siamese cat hanger, click the photo or link below for more details. 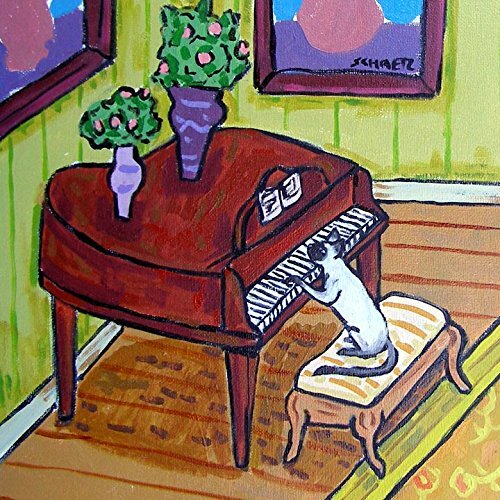 There's a further range of Siamese goodies over on our Gifts page, with presents for kids and adults (and cats too, of course) including a sister tile to the one shown below - a cute Siamese cat in a wine bar which is part of the same set as this Siamese cat at the piano. 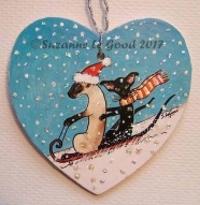 Made by SchmetzPetz and available from Amazon. 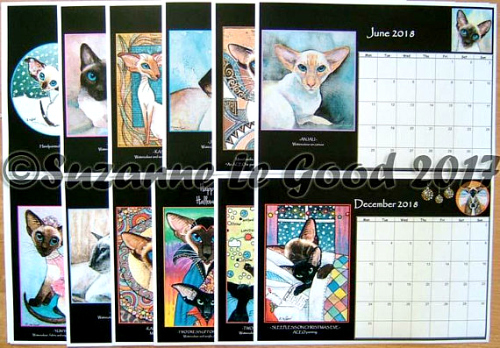 And although next year is almost upon us, it's not too late to order yourself a new calendar for next year - check out our page of Siamese cat calendars for our selection for 2018. 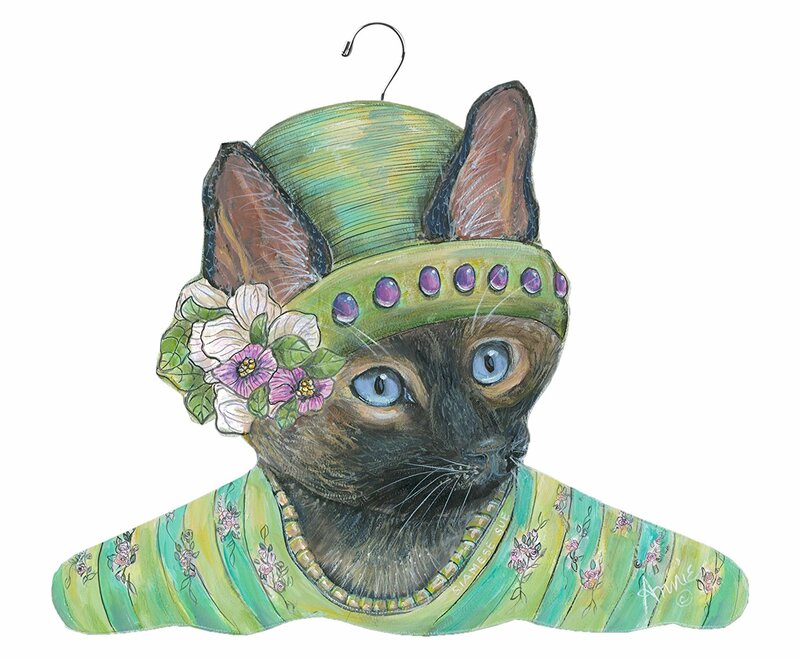 Spare a thought for Donna Jeanne Sadeghi's very patient older cat Meadow. Peacefully minding his own business on his cat platform one day - and then along came young Meezer Drew, who thinks that Meadow is a wonderfully comfortable place to rest for a while. And obviously thinks it's hilariously funny, too. Nice fangs, Drew! Thanks to Donna for allowing us to share this here. Wherever you are and whatever you're doing for your particular holidays, whether barbecuing on a beach (for our Australian and New Zealand friends) or enjoying a snowy Christmas with roast chestnuts and cosy fires (the rest of us) we hope you have a great time with family, friends, and Meezers! We'll be back in January with a look at the year ahead in 2018.